Welcome to the DecisionDirector Knowledge Base. We're glad you've joined us and we are here to help you get the most out of DecisionDirector. Please feel free to explore the on-line help, documentation, videos, and more. Use the table of contents on the left to navigate to topics and articles. Suggested reading and new and updated articles are listed on the right. You can also search for articles and, if you don't find what you need, you can click the Contact Support link on the left submit your question and we will get back to you ASAP. We will always be adding new content and improving what's already here, so please use the rating and comment section at the end of each article to let us know what works, what doesn't, and what you need that we've not yet provided. DecisionDirector was created to increase the value of complex planning, procurement, and business process redesign projects while reducing the overall cost to the enterprise. DecisionDirector is most often used by IT, PMO, and Procurement project teams and their project stakeholders to support software and services planning and selection projects where stakeholder involvement is essential and the resulting procurements are substantial. DecisionDirector also makes it easy for project teams to share business process documentation, or any documentation for that matter, with stakeholders for their review and feedback. 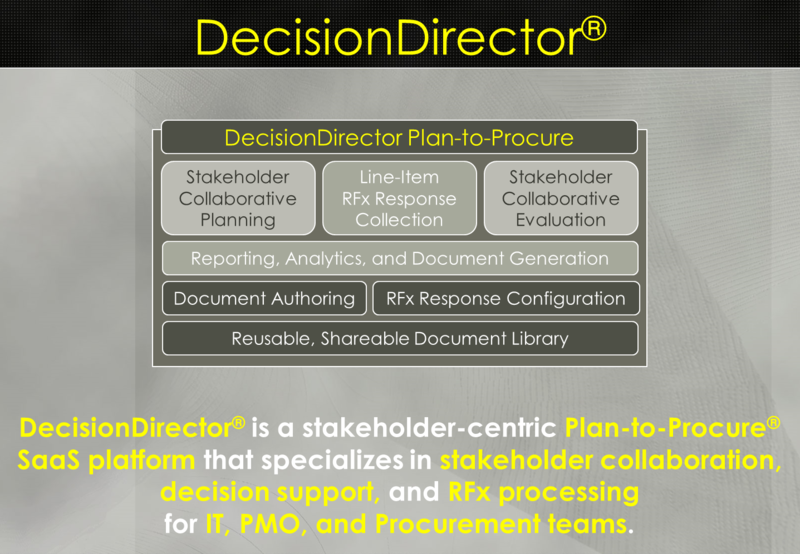 The image below summarizes DecisionDirector, with an emphasis on stakeholder collaboration and procurement (RFx) support. Click on the image to see the full presentation.